Propitiation—few Pauline words have generated more fountains of theological ink than this (hilasterion). Debates about what Paul intended go back as far as Origen. Post-Reformation, it has pretty much been five hundred years of ambiguity and theological hair-splitting. Depending on who might be your favorite “go-to” theologian, or what your favorite lexicon/commentary might be, you might be convinced the word means expiation,[i] propitiation,[ii] or atoning sacrifice. [iii] Ask one hundred scholars what they think it means and you are likely to get one hundred different answers. Proponents of the penal substation theory of the atonement use this verse as one of their allegedly “clear and definitive” proof texts for their point of view. Well, not so fast. Here comes opinion one hundred and one! We do not share Paul’s context. Many things that were familiar to him and his audience are not to us. Shoot, even one of his contemporary peers found him hard to understand! [iv] It is not any easier for us! Also, when the word is used only once in his epistles, it adds another layer of difficulty. We do not have any comparative to get to: “Oh, that clarifies things!” We are left with cultural use, linguistic analysis (etymology), and biblical typology. Because of these things, we must proceed cautiously and humbly, and not over-state our certainties. It was a gift given as a memorial, not a sacrifice. It refers to a definitive object in a place, often a statue or pillar. It does not refer to a spiritual abstraction. It refers to something permanent, remaining–not something killed, destroyed, torn down, or offered to a deity in a destructive way. It never refers to an action of sacrifice, nor the sacrificial victim/animal. The Septuagint uses hilasterion as the word to translate the Hebrew kapporeth /kippur—the place of covering/atonement/to cover—the mercy seat. It can legitimately be understood as “place of mercy.” What is Paul trying to communicate? If a propitiatory sacrifice was Paul’s intent, he could have used a very specific and unambiguous phrase that meant it. He did not do so. [vi] Whatever his intention, hilasterion does not mean an act of sacrifice, nor the victim of a sacrifice. Nearly all English translations get this wrong. The NRSV comes closest with “a place of atonement.” Other variations are: a place of propitiation or a place of mercy. The point of emphasis is a location where mercy and reconciling peace occur, not the act of propitiation itself. 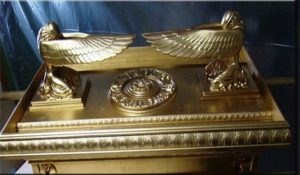 Because there had not been an ark and mercy seat in the temple for centuries, some think it unlikely that Paul could have had it in mind. I think it more likely that with his Jewish background and Rabbinical training that the association would be virtually inevitable–not only in Paul’s mind, but also in the minds of any Jews who may have been in the congregation. Other scholars disallow the mercy seat association because they believe it would have been an incomprehensible metaphor to a predominantly illiterate Gentile audience with no familiarity with things Jewish. I think Gentiles would have grasped the Hellenistic understanding as easily as the mercy seat reference would have been by the Jews. They are both metaphors but from different cultural frames of reference and would be understood in a complementary way by Paul’s audience. How well Gentiles may or may not have understood Jewish references is not possible to know with certainty. But it is not inconceivable that some cross-cultural understanding developed in the congregation. I am not a fan of over-stated typology. I think it needs to be used cautiously with restraint. The problem with typology is you can make it into anything you want it to be. One person’s revelatory typology is another’s nonsense. The Jews sure took issue with how the apostles (especially Paul) used typology. Well, here comes mine. The most common understanding of Christ’s death is that God’s wrath (or honor or justice depending on variation) must be “satisfied” or “paid” to appease his righteous indignation against humans. This payment is alleged to be made to Himself in the blood of Christ. His determinate hostility and desire to damn the entire human race [vii] is allegedly “satisfied” through Christ’s death. The blood of Jesus is satisfactory payment of the sin-debt humanity owes to his implacable holiness and justice. The payment of the sin-debt then releases God’s love instead of his wrath. In this scheme, the mercy seat is seen “plainly and definitively” (sic) as a type of payment for sin. This motif is called the penal substitutionary atonement theory. Let’s work the mercy seat typology a bit. On the cross, as He was being brutally tortured to death, the words that Jesus said were not: “Father, I look forward to the day where I will get justice and you will even the score against my enemies.” But rather, He kept repeatedly saying:[xi] “Father, forgive them, for they do not know what they are doing.” At Calvary, our violence directed at the Son of God was met not with retribution and vengeance but with mercy and forgiveness—before he was raised for our justification. I suggest that the High Priest’s offering of blood on the mercy seat is not a blood-payment to God, but in type, admission of identificational guilt. The High Priest represented Israel. In him all of Israel stood against a solitary animal that they slew. In type, it’s a foreshadowing of a place where the bloody, collective guilt of the human race will be met by mercy, once and for all. And in that place, the glory of God will dwell, and the angels will look on it and not understand,[xii] exactly as what occurred at the mercy seat, in type. He is our peace, who has broken down every dividing wall [xiii]–between one another and God. God was in Christ, reconciling the world to Himself [xiv]. Note: the language does not say: God was satisfying Himself with payment for sin. No. It was at Calvary where hatred and murder were met with mercy. In the resurrection, Jesus did not greet His cowardly and betraying disciples with a Terminator-like: “I’m baaaack, I am going to even the score.” But rather with: “Shalom, (peace) do not be afraid.” Why that greeting? They were expecting retributive vengeance. Instead, they got what hilasterion represents: reconciling mercy. In the depth of the vortex of the cosmic iniquity of the murder of God at the hands of His creation, we discover not a god who demands payment to satisfy his offended honor and justice, but the forgiving-victim-God, who gives mercy in the presence of injustice, and in doing so, transforms the fabric of the cosmos. I believe it is intellectually honest and spiritually appropriate to admit that no one knows definitively what the term means in Paul’s usage. There are diverse perspectives of “informed opinions,” including my own. I believe Paul’s use of hilasterion/mercy seat was used precisely because both his Jewish and Gentile audience would understand it in the context of reconciled peace. Penal payment for sin is not “clearly and definitively” what it represented. Rather the perspective presented here is just as valid a possibility, and from my point of view, more consistent with Christ’s life, words, ministry, death, and resurrection. Those who may be interested in a more detailed and scholarly presentation are referred to: Bailey, Daniel P. (1999), Jesus as the Mercy Seat. The Semantics and Theology of Paul’s Use of Hilasterion in Romans 3:25 (Doctoral dissertation). Retrieved from https://www.repository.cam.ac.uk/handle/1810/251694. [iii]E.g. – NIV and others. [v]Bailey, Daniel P. (1999), Jesus as the Mercy Seat. The Semantics and Theology of Paul’s Use of Hilasterion in Romans 3:25(Doctoral dissertation). Retrieved from https://www.repository.cam.ac.uk/handle/1810/251694. [vii]This was Luther’s point of view and is the prevalent view in Evangelicalism today. [xi]Imperfect Active Indicative tense – something occurring in the past that was continuing to occur. The idea is that Jesus was saying this repeatedly, over and over. Steve, Screaming “Amen” from across the water. Been in this place for a while now and it has changed everything for me on every level, from the Lord’s Supper to everything else, staring with a true experience of the love of God. One day, hopefully, it will change the Church for sacrifice, blood sacrifice, is a pagan ritual, not a Christian one; scapegoating is a human ‘solution, one that we have put on God, with the Scriptures being a record of the journey out of creating Him in our own image, all the way until One came to reveal Him as He truly is, a God of all consuming love for His fallen creation. Sadly, when believers say that Christ ended sacrifice with his own perfect, consuming sacrifice, the irony is that they have not ended it at all but have sacramentalised it, perpetuating the satisfaction of God’s (so called) wrath into eternity! That is not the throne that I am anticipating standing in front of! It is the Father into whose arms I shall run! Our God is and never was a God of wrath – if there is anyone’s wrath that was appeased on the Cross, it was mans’, not God’s! The Lord satisfied, not God’s wrath, but ours!! He doused its fire, as you say, with a response of “Forgive them…” And as you say, not with judgment, but mercy — and I weep as I write this dear brother. you have so excited me with this post. This has become The Way that the world has been shown since that day. And as the Christ followers, we are called to be the witnesses to that by living out the message in front of the world. So excited by your post but it will get you in big trouble! Blessings and keep it coming. Thanks, Alec. I concur 100%. The majority of the world has never heard the real gospel. What they have heard is Augustine’s (Luther-Calvin) and Anselm’s opinion mixed in with Constantinianism. Over the last 8-10 years I have been consistently migrating away from Western (Roman Catholic and Protestant) points of view on just about everything. It thrills me to know you are on the same journey, and at one level, does not surprise me. So much is at stake. Yes, my small circle of friends grows smaller by the day! LOL. But I do not care. I just pray this Molech-Torturer God that they worship will be exposed some day for what it really is. Moses’ attempt seems to both succeed and fail in the same moment. Yet comes the idea of a “covering” or shelter at a decisive time.